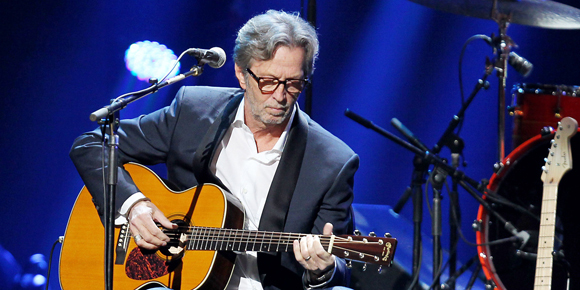 In the program of his last year's 70'th birthday celebrations, Eric Clapton wrote a personal note saying “I swear this is it, no more…..I know I've been threatening retirement for the last fifty years, but I didn't think I'd ever really want to stop,” and seems set to uphold his promise to devoted fans with four North American shows announced for this year. Accompanied by a band comprised of Walt Richmond, Steve Gadd, Nathan East, Chris Stainton, Sharon White and Michelle John, the beloved guitar legend will arrive at The Forum on Friday 15th September -make sure you're there! Few artists need an introduction less than Eric Clapton, legend of rock and widely considered one of the world's greatest guitar players. Starting with The Yardbirds in 1963 and staying with them till 1965, Clapton, already something of a prodigy from the age of 16, developed a distinctive style influenced by blues guitarists including B.B. King and Buddy Guy, leading him to become one of the most frequently spoken-about guitarists of the UK music scene. In 1966, Clapton was invited by drummer Ginger Baker to join him and bassist Jack Bruce (previously of Manfred Mann) to join his freshly formed band Cream, creating one of the earliest supergroups. Each musician already well-known, they immediately launched a successful touring career. During this time, Clapton began to develop as a singer and songwriter, though Bruce remained on most of the vocals and writing most of the words with lyricist Pete Brown, and as for his development as a guitarist, had come to be portrayed as Britain's best by fans of the developing blues-rock sound in 1967 – “Clapton Is God,” became a common phrase to be seen spraypainted as graffiti. With the intention of deflecting the obsessive “star” culture that had build around him, Clapton went on to form Derek and the Dominos, in which he played purely as guitarist, not taking centre stage, and saw colossal commercial success with the song “Layla”. Following this, he went on to forge his solo career and has had continued, much to the happiness of devoted fans, to this day.